BEFORE THE MASSAGE: We recommend scheduling your appointment for a time that you know you will not be rushed. Wear comfortable clothing that is easy to get in and out of, or bring a change of clothes that you will feel good wearing after your massage. Eating a heavy meal or drinking large amounts of caffeine or alcohol before a massage is not ideal. You also don't want to be hungry as that will distract from your relaxation experience. AFTER THE MASSAGE: Drink lots of water! This is important to flush out toxins released during the massage and re-hydrate the newly relaxed muscle and connective tissue. It is always best to not have too much scheduled for after your massage. Light exercise can be good after a massage but nothing too strenuous is recommended. If you have dry skin, leaving on the high quality massage oil we use is a good thing to do. Taking a salt bath is highly recommended to continue detoxification process, further loosen the muscles worked on during massage, and prevent possible soreness the next day if deep work was done. This Sanskrit word can be translated as the "science of life" or "knowledge of life". Performed on the floor or on the bed the therapist works on the energy lines, which run through-out the body. 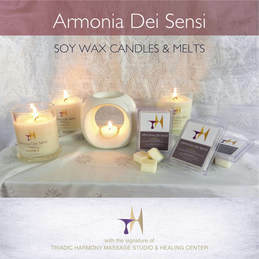 Candle Therapy unites the powers of mind, body, and spirit, since it combines the uses of candles and psychological principles to produce positive transformation in ones life.